The opening of the exhibition will be accompanied by a book launch, ‘Jangarh Singh Shyam, A Conjuror’s Archive,’ authored by Dr. Jyotindra Jain, who has had an extensive engagement with the works of Jangarh, having known him personally and following his practice. KNMA has expanded its curatorial and exhibition program in the last few years. Since 2017 a special exhibition category has been introduced, to open up discourses around preceding pre-modern, traditional and indigenous art practices, and critically examine their influence and appropriations in urban contemporary art. The first of this kind was ‘Amruta Kalasha, Thanjavur and Other South Indian Paintings’. This year the exhibition on Jangarh problematizes ‘the tribal’ and ‘the contemporary’. Jangarh was born into a Pardhan Gond family in the village of Patangarh in Mandla district, of Eastern Madhya Pradesh. He is much discussed for his creation of a new style, which is named after him as ‘Jangarh Kalam’. A unique style when compared with traditional tribal art practices. Its initiation happened early when Jangarh met J. Swaminathan (who was then Director at Bharat Bhavan) during a talent scout. 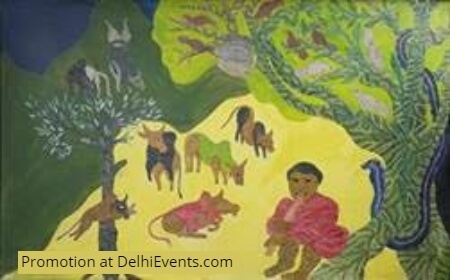 Swaminathan convinced Jangarh to relocate to Bhopal and work as a professional artist.Jangarh’s primary subjects were sometimes Gond deities like Thakur Dev, Bada Deo and Kalsahin Devi and at other times were applique styled portraits of animals, trees, folklore imagery and landscapes of the place where he grew up, placed next to objects and entities from urban settings, like aeroplanes.